The tragic shooting at UAB Highlands hospital in Alabama last month highlighted the importance of security in health care settings. At any time, nurses, technicians, doctors and other health care workers can be at risk of violence from not only aggressive patients but from disgruntled staff members. While this risk remains relatively minimal, we wanted to take a look at what hospitals are currently doing to keep their employees safe. Last month, 31-year-old Trevis Devon Coleman, a sterile supply employee at UAB Highlands hospital, shot and killed 63-year-old nurse Nancy Swift and injured 28-year-old instrument management supervisor Tim Isley, the Daily Mail reported. The shooting took place on the 2nd floor, and allegedly Coleman opened fire after a dispute with Swift. The incident brings to light the many issues surrounding security protocols in hospitals. UAB Highlands did have metal detectors in place, and it is unclear how Coleman brought the gun into the building. According to AL.com, his co-workers say Coleman had a history of problems on the job. There is growing conversation over the reality of violence that nurses and other health care workers experience on the job. Violence can be perpetuated by aggressive patients and those under the influence of substances. However, as the UAB tragedy shows, hospital administrators are having to be mindful of team disputes that may escalate into a violent act. Currently there is no federal law requiring hospitals to report workplace violence. However, violence is the cause of 10 to 11 percent of workplace injuries in the health care sector compared to just 3 percent for the private sector, according to a report from the Occupational Safety and Health Administration. And a survey by the International Association for Healthcare Security and Safety found that reports of violent crime at health care institutions increased 40 percent between 2012 and 2014. In response to these threats, Hospital Administrators have increased their scrutiny on what measures they need to employ to protect workers. Thirty-three percent of hospitals use handheld metal detectors, while 7.5 percent use walk-through versions, according to the 2016 Hospital Security Survey conducted by Health Facilities Management and the American Society for Healthcare Engineering. Many of the hospitals that use the walk-through version have only installed them in the emergency room and not at the main entrance of the facility. According to Modern Healthcare, the cost of staffing the detectors is a common deterrent to their installation. Another measure hospitals have been taking is to hire security staff to monitor the facility and respond to incidents, but some hospitals are considering expanding their security personnel. Aberdeen Hospital in New Glasgow, Canada, for example, spent more than $930,000 on security guards and an additional $425,000 to on standard security services, CBC News reported. The debate also continues regarding arming security guards, with 52 percent of hospitals reporting their guards carry handguns, according to a 2014 IAHSS study. 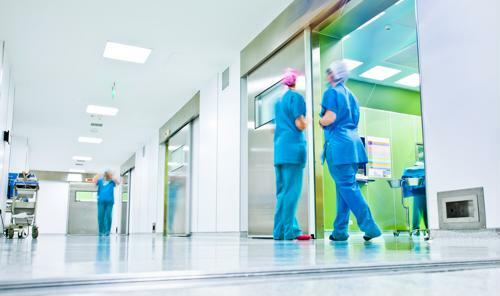 While the optimal way to protect health care workers may not yet be clear, hospitals have been setting aside the funds necessary to adopt enhanced security measures to keep staff safe.